CRISC training from Simplilearn, aligned to ISACA 2015, ensures you ace the exam in the first attempt. The training is designed to excel you in tasks such as managing the IT risks, design, implementation, monitoring and maintenance of IS controls. Develop a working knowledge of the 4 domains areas as prescribed by ISACA –Exam Candidate Information Guide 2015. How do you become a CRISC certified professional? What are the prerequisites for CRISC certification? A completed application must be submitted within 5 years from the date of initially passing the examination. This experience must have been gained within the 10-year period preceding the application date for certification or within five years of passing the examination. Three (3) or more years of cumulative work experience performing the tasks of a CRISC professional across at least two (2) CRISC domains, of which One must be in Domain 1 or 2, is required for certification. There are no substitutions or experience waivers. What do I need to do to unlock my certificate? What all will I get as part of the training? You get access to our e-learning content along with the practice simulation tests that help you tackle the toughest of the exam questions. You will also get an online participant handbook with cross references to the e-learning for reinforcement of your learning. No. The exam fee is not included in the course fee as it is directly paid to ISACA for the membership, application and examination. How many questions are there in the CRISC certification exam? ISACA uses and reports scores on a common scale from 200 to 800. For example, the scaled score of 800 represents a perfect score with all questions answered correctly; a scaled score of 200 is the lowest score possible and signifies that only a small number of questions were answered correctly. 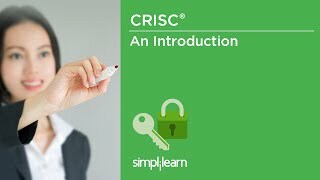 You need to achieve a score of 450 or higher to pass the CRISC® Exam. After successful completion of the training, you will be awarded the course completion certificate along with the 20 CPE hour certificate from Simplilearn. What is the date of the next CRISC exam? Can I defer my exam? If you are unable to take the exam, you can request a deferral of your registration fees to the next exam date. To learn more about deferring your exam, including deferral deadlines and costs, please visit http://www.isaca.org/certification/pages/exam-deferral.aspx. Yes, we do provide assistance for the exam application process. You can state your queries on community.simplilearn.com and get them answered along with any other query or concern that you might have about the course. How does Simplilearn assure me that the training and course material delivered are effective? Our CRISC course is developed to deliver a first attempt pass rate of 100%. With a hands-on learning approach, the training not only gives you the confidence to clear the exam but also helps you retain the knowledge beyond the examination. Yes, you can cancel your enrollment. We provide you a refund after deducting the administration fee. To know more, please go through our Refund Policy.